SF Signal rates DARWIN 4.5 / 5! 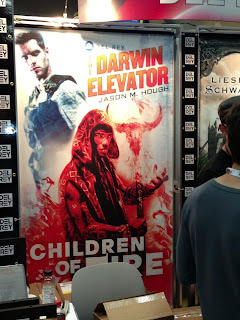 SF Signal has posted their review of THE DARWIN ELEVATOR, giving it 4.5 / 5 stars! They've also got an interview to go with it, if you're into that kind of thing. What follows is a diary of sorts. 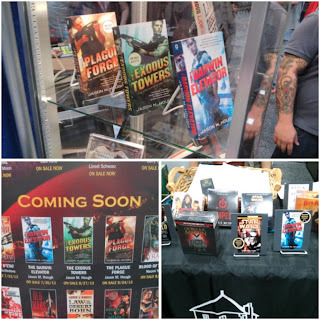 If you're interested in what it's like for a debut author to have a book launched at San Diego ComicCon, I guess you've come to the right place! Technically last year was my first ComicCon as a professional, but it was really just a tag on my badge back then. Other than meeting my editor, 2012 didn't really feel much different than any other year. 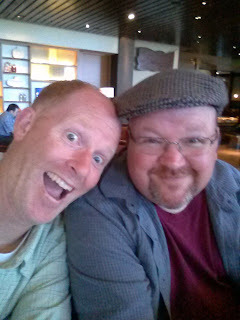 Luckily Kevin Hearne saved me from doing work when he sent me a text that he was alone at the bar and that being alone at the bar was lonely. There was drinks to be drank! He introduced me to Diana Rowland, we all had beverages (much grief given to me for ordering an Arnold Palmer), and by 4pm I found myself sitting with Ty Franck (half of the duo known as James S. A. Corey) and George R.R. Martin, talking football and Hollywood. A wonderful chat, and although it was an honor to sit with Mr. Martin for a while, meeting Ty and later his cohort Daniel Abraham was a highlight for me this year. Both great guys and extraordinarily talented. Slackjawed, I somehow managed to say hi to everyone before continuing to wander the floor. As always the costumes, even on Wednesday night, were a wonder to behold. Time slips by at an incredible speed when you're immersed in that kind of sensory overload, and before I knew it it was time to meet up with my agent Sara Megibow for dinner. We went to Searsucker, and despite nightclub-loud music we managed to have a great chat over some excellent food. 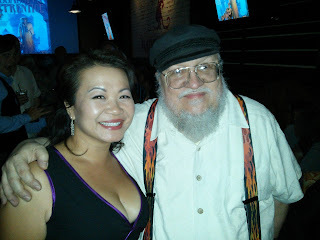 She surprised me at the end of the evening by pulling 10 copies of Darwin out of her bag for me to autograph. That's when I learned they were on sale at Mysterious Galaxy's booth. She'd bought all 10 there immediately upon arrival. My schedule on Thursday was largely empty, so I went back to the floor and wandered some more. Mostly I wanted to get a picture of my book on a store shelf, and of course buy it just because I could. After lunch I met up with Sara again and we walked across the street to find the Geek & Sundry lounge, where she had some business to conduct. We stayed for snacks and watched people play the Star Trek Settlers of Katan before parting ways to get ready for the Random House party that evening. My wife had arrived by then, and was waiting at the hotel when I returned. We met up with The Hearne again and were whisked away in a black town car to the party at Bootlegger. Walking in we were greeted to the cover of The Darwin Elevator on every TV screen in the place. For a second I was mortified that this image would be there all evening, but luckily two seconds later the picture changed to another novel. All of the books coming out this year were featured in the video, and as someone not used to spotlights of any kind I felt immense relief. 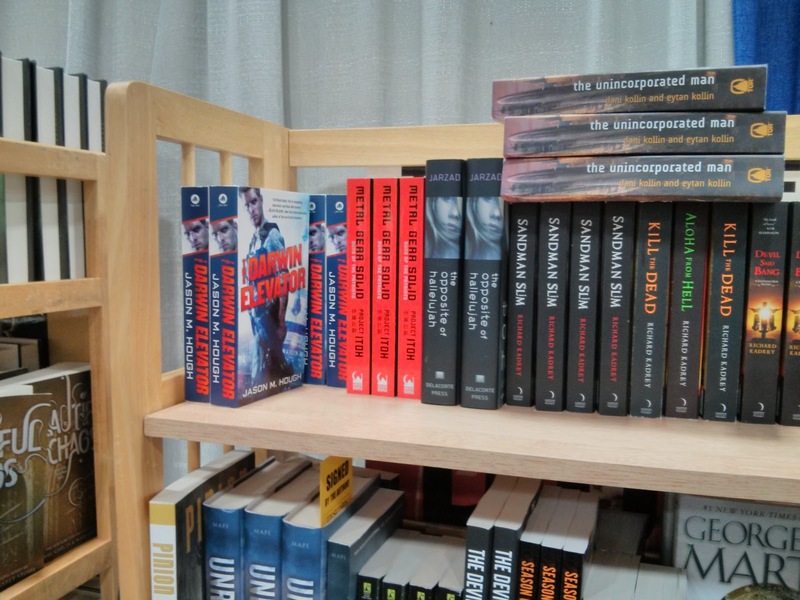 We clinked glasses with my editors Mike Braff and Sarah Peed, chatted with Diana Rowland some more, and ran into Eldon Thompson who I'd paneled with at WorldCon last August. 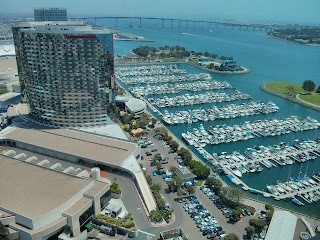 Friday I went to some panels, ate bad convention center nachos, and wandered the floor some more. I bought some retro Star Wars action figures for my son (geek dad moment), and a set of Stephan Martiniere's art books in hardcover. I promptly went to Stephan's booth and had him sign them. Then I dropped by Image Comics and picked up the first omnibus of Chew, based on Kevin Hearne's recommendation. 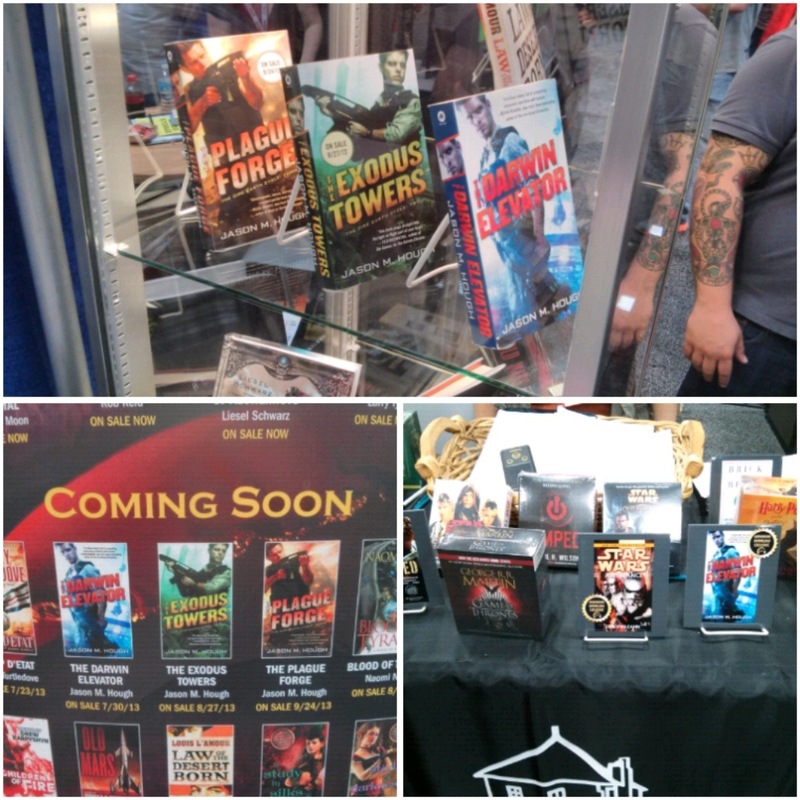 At 5:30 I found my way back to the Del Rey booth and sat "backstage" in their little waiting area until my signing. Had a great conversation with Tricia and April from Del Rey that eased my nerves a bit. That didn't last. To my surprise a big line had formed, and by the time I went out to sit at the autograph table they wrapped around into the next aisle. The hour flew by. 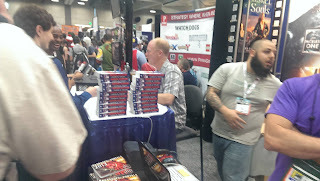 I signed almost two hundred books, all given out for free, and by the end my hand was cramped. I'd been so nervous and focused on signing that I only realized afterwards I hadn't really been chatting with the people who'd come to get a book signed. If you were one of them, please accept my apology! It was my first ever signing and I was overwhelmed. After that my editor took me and the family out to dinner, after which we turned in early. Saturday was for the kids. We took them to the show floor, where our oldest (age 3) got to meet Iron Man and Thor. He gave them both fist-bumps and was all smiles until the fatigue set in. By 1pm the kids were exhausted, so my kind and wonderful wife offered to take them back to the room and get them down for a nap while I headed off to my second signing event. ROUND 2: CHAT! This time I was over my freshman jitters and actually said hello to the people who waited to get a book signed. Duh! Shock of all shocks, they seemed genuinely happy about this, and were a wonderful bunch. I met a gentlemen from Darwin, Australia who accepted my apology for turning his hometown into a megaslum. Then one of the first sci-fi authors I ever read, David Brin, turned up in line. Surreal to sign a book for him, and in exchange he gave me a signed postcard. 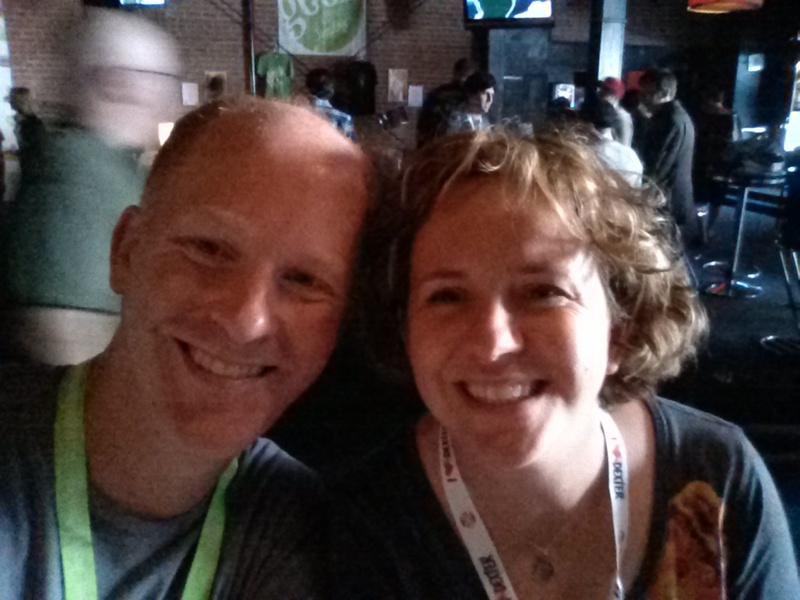 We agreed to meet again during WorldCon in San Antonio, where we'll be on a panel together. The encounter left me a bit speechless, but luckily the hour was almost up. I stuck around to sign a stack of books for the fine folks at Mysterious Galaxy bookstore, then headed back to the hotel for a nap before dinner. We went out again with The Hearne, this time for an "authors dinner" where we were joined by Greg van Eekhout and Max Gladstone. The restaurant, Kelvin, was completely empty. Typically this would be a sign to turn and flee, especially given the crowds outside, but after an appetizer of gourmet tater tots it was clear the food would be excellent and the quiet space a welcome perk. The conversation ranged from scorpion stings to near-death experiences in Amsterdam and everything in between. A delightful bunch of people to hang out with! Sunday finally rolled around. My panel was at 12pm, and again my wife came to the rescue by offering to take the kids for a walk after breakfast so I could relax. 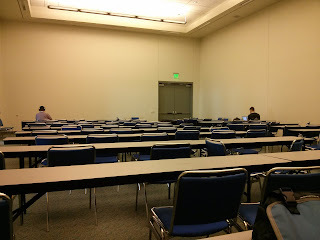 Around 11am I walked over to the convention hall, went to the room where the panel would be, and asked the woman at the door if there was a "special room" where a panelist could go to relax before showtime. I was trying to ask where the mythical green room was. The place where all the stars hang out. The place where I could play rock-paper-scissors with Nathan Fillion and enjoy gourmet snacks with Wil Wheaton and Adam Savage. "Sure," the woman said. "Come with me." So now you know the glamorous life of a debut author. At least there was water. Cold, even! I grew quickly bored in there, went back to the room where my panel would be, and sat in the audience for the session in-progress. The topic was YA, and like pretty much every panel I've ever been to, it was interesting and fun. 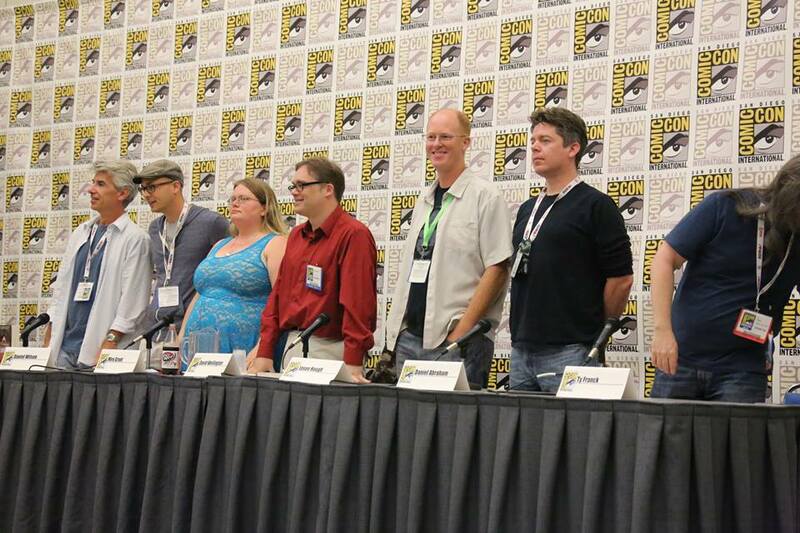 That panel ended and I made my way up front as my co-panelists came in en-masse from outside. Moment of horror: They were all carrying name cards. I didn't have a name card. 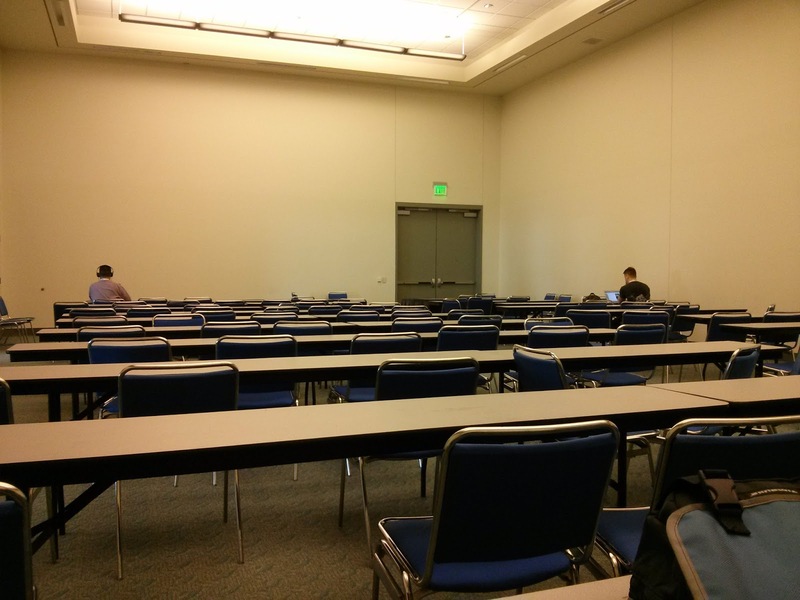 Did I miss some pre-panel meeting? Was it in that registration bag that I never opened? WILL I ASSERT MY NEWB STATUS SO QUICKLY? Daniel Abraham took pity on me and said, "Your editor has it. He's outside." Crisis resolved, we took the stage and settled into seats. 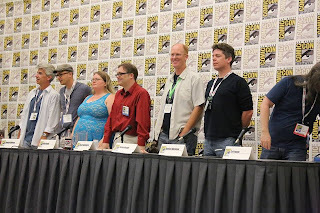 The moderator, Margaret Stohl, asked us all to stand back up again so pictures could be taken. If nothing else we can all agree that I had a height advantage on every one of them. On the whole the panel went fine. I didn't contract foot-in-mouth disease at any time, and although it was hard to get a word in edgewise sometimes, that was okay by me. I was among pretty illustrious company and more than a little nervous. In the end we all got to say a few things and the whole event was over too fast. Afterwards we shuffled over to the autograph pavilion and signed books for a while. 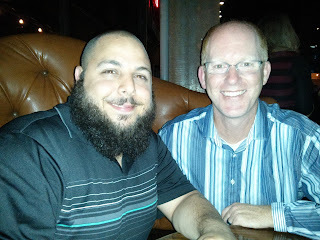 I got the chance to fanboy out on Daniel H. Wilson a bit (he sat next to me... no escape! ), and had a respectable stream of people seeking autographs. Given my book isn't even out yet, it was gratifying to see such interest. In all Del Rey gave away roughly 1000 copies of the book. They treated me like a rockstar and I couldn't be more grateful! Next up, WorldCon San Antonio! 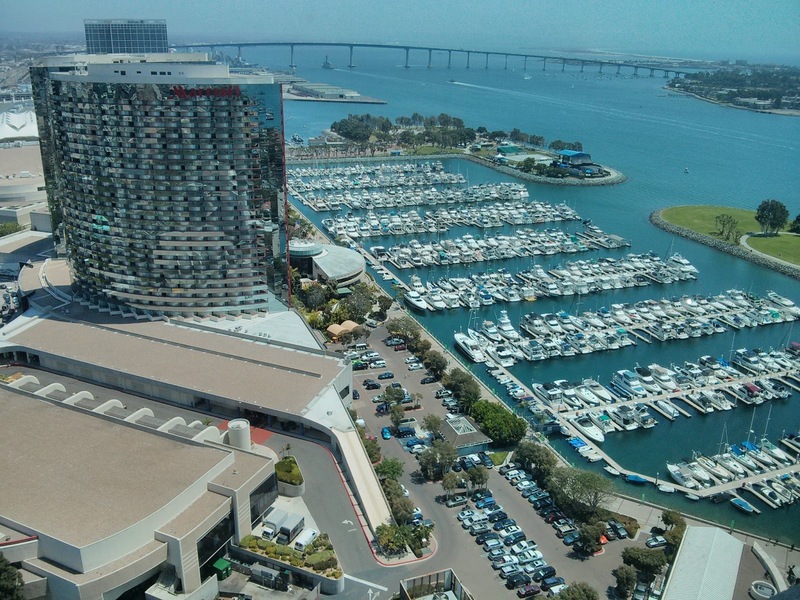 Thanks to the Qwillery for for hosting my post on the topic of place as character. I often get asked (yes, already) why I chose Darwin Australia as the setting for my novel, and this should serve as a fine answer! TOR is hosting a new short story by me entitled "Wave of Infection". The story introduces THE DARWIN ELEVATOR's main character, Skyler. For those of you who have read the book already, hopefully this serves as interesting backstory. I've blogged about this first "novel" of mine here before, but went into more detail in my "Dear Readers" post on SUVUDU. Have a look! It's been a hectic month, so I thought I'd collect a few things in one post here in case you missed them. First, as an audiobook fanatic it gives me great pleasure to announce that Simon Vance will be narrating all three books in the DIRE EARTH series. Simon was my top choice, and it's a humbling honor that Random House Audio signed him after my "it can't hurt to ask, right?" suggestion. Seriously, I could listen to Simon read the phone book. He's the best! Secondly, take a gander at my guest post on SF Signal regarding the use of space elevators in science-fiction. Every time we think surely, now, Hough cannot push events any higher, he finds new ways to escalate. Skyler has a particular knack for snatching defeat from the jaws of victory. Each chapter we think, surely Hough cannot punish our heroes any more, or reward Blackfield's ignominy. But rest assured, at nearly 500 pages, Hough has generous opportunities to push characters to new depths and make his readers cringe. I grew up reading books like this, paperbacks populated by oversized personalities, shifting loyalties, and surprise revelations. Heroes prove themselves by decisive actions, salted with judicious violence; villains marinate in their own venality until they prove their own undoing. Say what you like about John W. Campbell and Alfred Bester, but my Golden Age of Science Fiction was the 1980s, when SF was popular, but still boldly countercultural. Hough writes in that beloved sci-fi format, the trilogy, and while this novel has a satisfying conclusion, it asks tantalizing questions for future volumes. Del Rey so loves this series that it's launching the whole trilogy this summer: three novels in three months. Who can blame them? In a crowded, noisy genre, Hough claims territory that deserves our attention. It's enough to revive my flagging faith in science fiction. I've been lucky enough to have some fine reviews posted already, but this one made me a little misty. From spaceships and aliens to medical tampering and secret military weapons — science fiction books have never been as varied and exciting as they are now. Join James S.A. Corey (the writing team of Daniel Abraham and Ty Franck; Abaddon's Gate), Jason Hough (The Darwin Elevator), David Wellington (Chimera), Mira Grant (Parasite), Daniel Wilson (Amped), and D. J. MacHale (Sylo) as they discuss their new books and the vivid visions science fiction has to offer, from distant space to our own backyards. Moderated by Margaret Stohl. 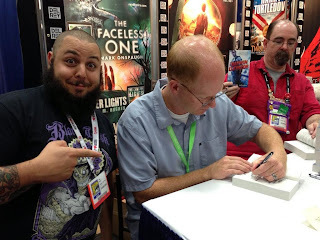 I am assured by Del Rey that there will be things for me to be able to sign at these signings, which *might* mean you can score a free book if you come by. So, you know, do that. In other news, my friend Kevin Hearne's new Iron Druid book HUNTED is out.